II Corps passed through this neighbourhood on the Retreat from Mons in August, 1914, and it was lost in the early days of the Fifth Army retreat in March, 1918. ALAINCOURT GERMAN CEMETERY. BENAY MILITARY CEMETERY (3 British, February and March, 1918). CHEVRESIS-MONCEAU COMMUNAL CEMETERY (116 German; 40 French; 3 British, March and April, 1918). CILLY GERMAN CEMETERY (6 British, September, 1918). CLASTRES NEW FRENCH MILITARY CEMETERY (14 British, February and March, 1918). CUGNY MILITARY CEMETERIES (Aisne, near Ham; the 2nd Royal Irish Rifles held out and were annihilated here 24 March 1918); used by British and Germans, it contained 88 British graves of February-June 1918. DURY CHURCHYARD (Aisne; 5 British, March 1918). ESSIGNY-LE-GRAND GERMAN CEMETERY (200 German and 99 British, March and April 1918, largely 36th (Ulster) Division). FONTAINE-NORTE DAME GERMAN CEMETERY (Aisne, 900 Germans; 12 French; 2 British, March 1918). FONTAINE-UTERTE COMMUNAL CEMETERY GERMAN EXTENSION (500 German; 23 British, March 1917-March 1918). GRUGIES COMMUNAL CEMETERY (2 British, January 1918). HIRSON COMMUNAL CEMETERY FRENCH and GERMAN EXTENSION (14 British, December 1917-October 1918). LESDINS FRENCH MILITARY CEMETERY (4 British, September 1918). MARCY CHATEAU GERMAN CEMETERY (2 British, September 1918). MARBLES COMMUNAL CEMETERY EXTENSION (17 British, April-October 1918, besides French, Italian, Russian and Germans). MENNEVRET COMMUNAL CEMETERY GERMAN EXTENSION (312 British, August 1914, March, October and November 1918). MEZIERES-SUR-OISE GERMAN CEMETERY (200 German, 24 French, 1 British). MONCEAU-LES-LEUPS GERMAN CEMETERY (1 British, February 1918). MONCHY-LAGACHE CHURCHYARD (4 British, May 1917 and September 1918). NOUVION-ET-CATILLON COMMUNAL CEMETERY GERMAN EXTENSION (13 British, February-August 1918). ORIGNY-EN-THIERACHE COMMUNAL CEMETERY GERMAN EXTENSION (200 German; 13 French; one American; one British, October 1914). REMIGNY FRENCH MILITARY CEMETERY (33 French; 13 British, February and March 1918). ST. MICHEL COMMUNAL CEMETERY GERMAN EXTENSION (Aisne; 132 German; 23 French; 6 British, August-October 1918). SEBONCOURT FRENCH MILITARY CEMETERY (99 French; 1 British, October 1918). SERAUCOURT-LE-GRAND COMMUNAL CEMETERY FRENCH EXTENSION (13 British, February and March 1918). VERVINS GERMAN CEMETERY (390 German; 20 Italian; 15 French; 7 British, May-September 1918). There are now over 2,000, 1914-18 and a small number of 1939-45 war casualties commemorated in this site. Of these, almost two-thirds from the 1914-18 War are unidentified and special memorials are erected to two soldiers from the United Kingdom, known or believed to be buried here. Other special memorials record the names of 32 United Kingdom soldiers, buried by the enemy, whose graves could not be found. 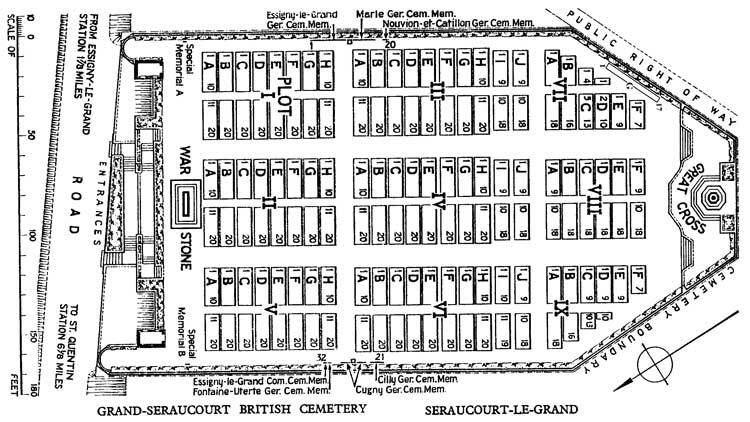 In Plots III, IV and V are many graves, identified collectively but not individually, which are marked by headstones superscribed: "Buried near this spot". The British Cemetery covers an area of 4,732 square metres and is enclosed by a stone rubble wall.